and to gather to discuss a different topic. When we begin to do something in the group it becomes a matter of course which is very difficult to leave that way in the middle of the journey. After arriving in the United State Sangini Rana and I decided to form an Indigenous women's organization as we were used to advocating the rights of indigenous women in Nepal. 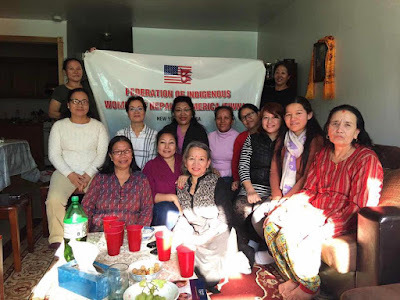 We registered our organization as Federation of Indigenous Women's of Nepal in America (FIWNA) in New York. Our goal was to unite the indigenous women of Nepal in American under the same umbrella and work for the preserve, protect and transmit our culture, languages, and tradition to our new generations. We have the wide area of objectives to work to the indigenous women of Nepal in America, but due to the busy schedule, we are not able to perform as much as we have planned. We had been doing at least two or three programs in a year and at least one meeting within every once or twice in a quarter. But after I started my study I became really busy as a working student and couldn't devote my much time after then. I tried to manage my very tight schedule to the organization for some while but which wasn't enough. It became lesser than that after I got my baby. The activity almost became null in my absence. Even though we became unable to do as per our objectives, we developed our culture to help each other. Our organization became the source of companionship and love and converted as family members. We haven't given away our hope even we face thousands of criticism for not doing any remarkable activities to the community, but we are standing along the way together and dedicated to our culture to build a love and companionship and support to each other whenever someone undergoes to any kind of difficulties. We have a great vision to work with the indigenous women, but due to the busy schedule here our invisible activities have created a great moral support and strength to build the power of women and we are proud to be united. Regardless of what people think and say we are moving forward as on the race of turtle and we will reach one day to the destination. We are united, we are supportive of each other, we are here for all the members for moral support, emotional strength, companionship to make a bond of love within us. And we are also ready to help to each other as per the capacity when needed. We haven't done the big thing doesn't mean we are disappeared and we are running away. We have a hidden strength that is our unity. We never hesitate to contribute and devote our time for the sake of our friends and members which are the great outcomes that we have developed as of our organizational culture.